Discussion in 'English Only' started by hehehehe, Dec 1, 2007. She was following closely behind him, like a running back behind a blocker. Could you please help me? I can't understand this sentence. It's a reference to American football. These are both positions. 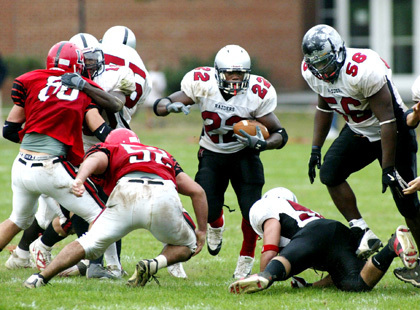 A running back is they guy who takes the ball from the quarterback (the one who throws the ball) and runs with it (the ball is handed off to him, the quarter back does not throw it to him). The blocker blocks the running back from players on the other team trying to tackle him. The running back stays close to the blocker so that the other team must get close to the blocker to tackle him and thus it makes it easier for the blocker to block them. The guys in white are blocking the guys in red so that the guy with the ball can run past them. It is a figure from American football. Blockers are offensive linemen. Thank you TheAmzngTwinWndr and GreenWhiteBlue. I'm crystal clear now.